I had quite a few white circle 1″ stickers around the house so I created this Pin the Tail on the Bunny free printable. All you need to do is print the adorable bunny and start playing. Download your FREE bunny at the bottom of the blog post. Hang the picture on a wall. Blindfold the child (or trust he/she to keep eyes closed). Write all the children’s name on the white sticker dots who will be playing the game. Give the first child a white sticker dot. If you do not have white sticker dots, cut out a 1″ circle and put tape on it. Spin the child around 3 times and point them in the direction of the bunny. The child walks over to the bunny picture and tries to put the white sticker exactly over the bunny’s tail. The person closest is the winner! Try playing it again this time put the bunny picture on the floor. The child have to crawl across the room, eyes closed, to find the picture and pin the tail on the bunny. This activity is great for parties, Easter games and a boredom buster. 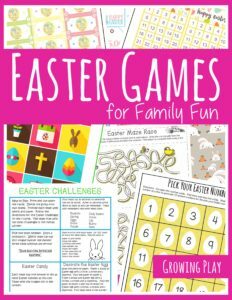 Do you need more Easter games that require little to no preparation that the kids will love? Get more information on Easter Games and download another free game.